Toxic Chicken – Make My Day | Esc.rec. All music and artwork by Toxic Chicken. 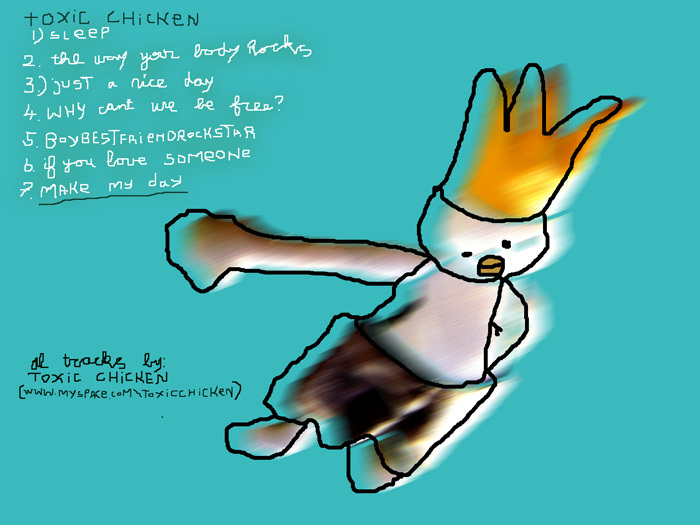 ‘Lo Fi’ (esc.rec.16), Toxic Chicken’s debut on esc.rec. is still ‘kakelvers’ (as we say in the Netherlands), only to be followed swiftly by ‘Make My Day’, a free mp3 release! ‘Make My Day’ sounds somewhat more subtle than ‘Lo Fi’. But most of all it sounds still unmistakably Toxic Chicken-ish all over again. Because you’re probably downloading or listening to this (high quality!) free mp3 release right now, making up your own mind is faster, easier and more reliable than reading this press release, so I’ll leave it at this. Trivial Pursuit: Some of the sounds on ‘Make My Day’ originate from the knitting needles of Grannittin, on which Toxic Chicken also contributed two tracks.